Some soccer players have to zip down the field and strike the ball cleanly, yet like lightning if they expect to score. They are appropriately called 'strikers,' and need a shoe that supports their need to move fast and cause havoc. The Under Armour Create Boot was designed to give these players the speed they need to perform their function. The result of a design process that took 5 months of computer modeling, development, and footwear testing to complete, the shoe is one of the best designed specialty soccer shoes yet created. The goalie is no match against the soccer player wearing these Under Armour soccer shoes. Defenders will benefit from an Under Armour soccer shoe that is durable enough to last through a whole season, and continually drive the ball with maximum power, for defensive (and sometimes offensive) purposes. The Dominate Boot delivers both of these functions, and keeps the foot protected and as comfortable as possible. Defenders usually have to turn and pivot often as part of their role, so shoes with bladed cleats would be ideal. Under Armour designed this shoe to take this heavy amount of wear and tear with ease yet continue to outperform other soccer shoes on the market. Additionally, Under Armour has included their H20i Water Intelligence technology to ward off wetness, keeping players dry on the field and improving ball control. 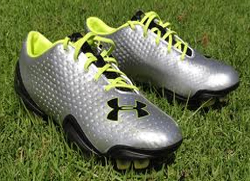 Under Armour Blur FG also fits into the soccer shoe scheme as a good model to wear for general midfielders running up and down the field, for players not mainly performing as strikers or defenders. The pro soccer players testing the brand's line praises the shoes, with the most frequent reports claiming that Under Armour soccer shoes are created to feel like they are molded right to fit the foot (this eliminates blisters) and that they provide proper balance. In addition, there are soccer players who have also indicated that these shoes on the field improve the quality in their strike, the shoe “sits perfectly on the foot, nice and tight," and that shoes work with the athlete instead of interfering with his movement. Soccer enthusiasts alike can also appreciate that Under Armour incorporates some style with their functionality, as they do with many of their products.